Say you have an online marketplace and you want to automatically split the payments for goods and services between you and merchants signed up on your platform, Rave has got you covered. Navigate to the Subaccounts page and click the New Subaccount button. 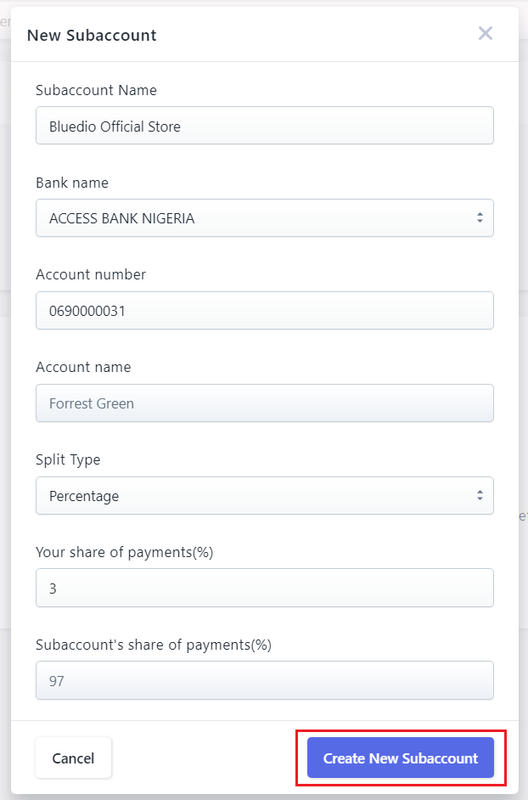 On the pop-up that is displayed, enter the details of the sub-account and specify the subaccount details. Also specify the type of split (flat fee or percentage split), and the share of payments. Click "Create New Subaccount" when done. Note: At the moment, the split payment option is only available for use via the Rave API and SDKs. When the subaccounts are created, they are automatically assigned an ID. You can include these IDs in any charge request payload and the payment will automatically be split between your bank account and the specified subaccounts. An example payload is shown below. Note: The split payment feature can only be used if your settlement option is set to automatic and not manual settlement.